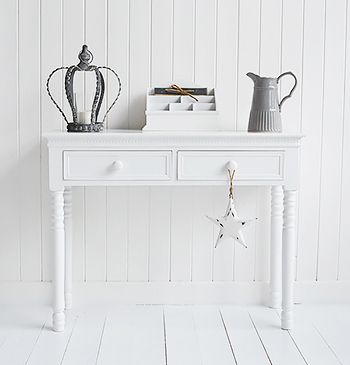 At The White Lighthouse we think a white hall table is an essential piece of furniture in your hallway which is why we offer many different options to buy... as a place to display white flowers, photos, and a lamp to add decor and interest to you hallway. When you enter your home, a place to set your keys and the post that has arrived that day. The size of the table greatly depends on how much room you have in your hall as you do not want an oversized piece of furniture that you have to squeeze past or are always knocking into with schoolbags or as you bring your laundry upstairs. If you have a small hall, a lamp table is probably the best option. Preferably you will want a hall table with some drawers for the storage of pens, notepaper, keys letters and coins. Baskets under the table are perfect to for children to throw their shoes into as they come into the house instead of leaving on the floor! 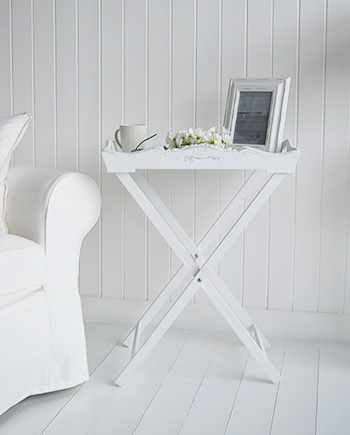 A very simple but elegant pure white table for hall or living room interiors. 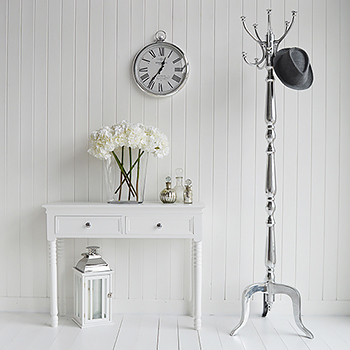 The New England Range is a crisp matt white range of furniture for a classic look to any room. As perfectly suitable for coastal interiors as it is for Victorian or country homes. The Colonial White half moon hallway table with a shelf, a perfect stylish and affordable option for smaller hallway and entry way spaces. A white hall table will lighthen your hallway, does not matter what colour your walls are, a white table will alway complement any colour... white on white for a coastal New England look, or a dark wall with a white table for a clubhouse feel. For any home style, coastal, New England, country, cottage, French, suburban, a white hall table will match in perfectly. Add some artificial white Hydrangea to great you and your guests on arrival, and they will last for years. A very cost effective way to have flowers all year round. By adding a coat stand in your hall you will not need much more furniture to complete. A simple tray table is enough if you just want to add a lamp to your hall. 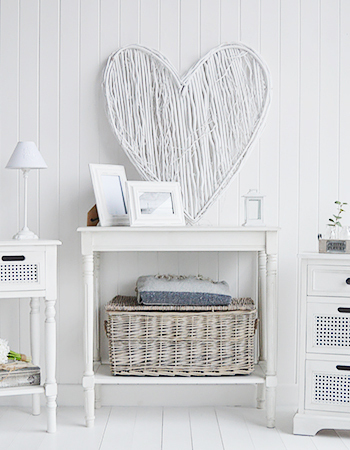 A chest of drawers is a great idea for a hallway console table asit gives massive amounts of the extra storage needed. 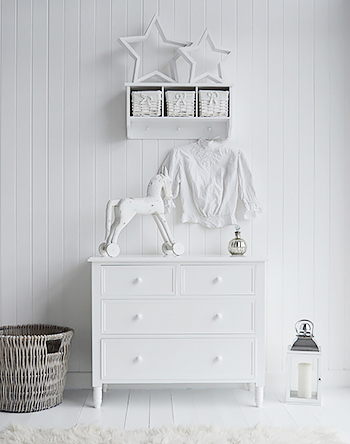 New England White Chest of Drawers for greater amounts of storage.